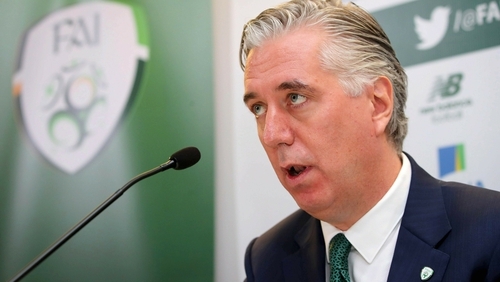 FAI Chief Executive John Delaney has confirmed he gave the association a €100,000 loan to help it through what he said was a short-term cash flow problem. In a statement on behalf of Mr Delaney, the FAI said the "bridging loan" was given in April 2017 and repaid in full to Mr Delaney in June of that year. In a second statement this evening issued by the FAI, Mr Delaney expanded on his comments. He said he acted in the best interests of the Association, at a time, he said, when immediate funding was needed. He described the loan as "a matter of timing," adding the loan had no impact on the full financial position or performance of the FAI for the year. He said he acted in "good faith" for the benefit of the FAI and he said he would continue to do so. On the issue of Governance, the statement said that since 2017, the board's emphasis on its governance and processes has been driven by the FAI to ensure it operates to all appropriate standards. At its most recent meeting, it stated, the FAI board had commissioned a "full review" of its executive governance and senior management structures by an external consultant. The report and its recommendations are expected in early April. It comes after the Sunday Times reported that Mr Delaney gave a €100,000 cheque to his employer. Mr Delaney said: "I am aware of stories circulating around this loan dating back to 2017. "I confirm that I made a once-off bridging loan to the association to aid a very short-term cash flow issue. "This is the only occasion on which I provided the association with a short-term loan." Mr Delaney is due to appear before the Oireachtas Committee on Transport, Tourism and Sport in April. Social Democrats TD Catherine Murphy, who is a member of the committee, has said the loan will form part of the committee's deliberations, as well as the issue of governance at the FAI and the development of the League of Ireland and underage game. Mr Delaney, who is a member of UEFA's Executive Committee, also confirmed that he would be donating his 2018 salary from the European governing body back to the FAI.